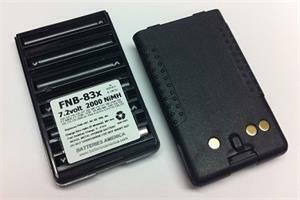 FNB-83x: 7.2volt 2000mAh rechargeable long-life Ni-MH battery for Vertex, Yaesu, and Standard-Horizon. 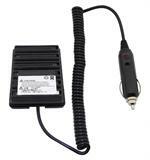 Superb quality & specially designed for thru-radio charging. 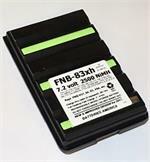 Replaces FNB-83, FNB-64, FNB-V57, FNB-V94, etc. Re-Charges through radios equipped with internal charging contact. 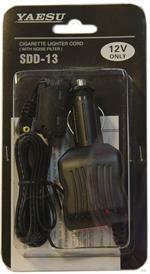 It also re-charges in Desktop Chargers (EMS-57-83, VAC-370B, & other Yaesu Factory models). 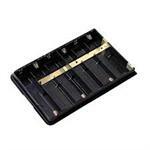 Fits radio #s VX-110, VX-120, VX-127, VX-130, VX-150, VX-160, VX-170, VX-177, VX-180, VX-210A, VX-250, VX-270, VX-277, VX-400, VX-410, VX-420, VX-800; VXA-150 Pro V, VXA-210, VXA-220 PRO VI, VXA-300 Pilot III, VXA-200 Aviator Pilot II; Yaesu FT-60R/E, FTA-230, FTA-310; Standard Horizon HX270S, HX370S, HX500S, HX600S, etc.